Laser techniques have become more and more advanced in the field of cosmetic enhancement over the years, and the SmartSkin™ CO2 ablative laser system from Cynosure® is one of the most state-of-the-art options available here at our practice. Our board-certified plastic surgeon, Dr. Semira Bayati, can use the SmartSkin™ laser to help you reduce signs of age and skin damage without the need for invasive surgery. This customized treatment can offer significant results after only one treatment. Plus, SmartSkin™ laser treatment does not typically require extensive recovery times. With SmartSkin™ laser skin resurfacing, Dr. Bayati can help you take years off your appearance and have you feeling great about the way you look. If you have questions about how this procedure can achieve your goals, please contact Dr. Bayati today. 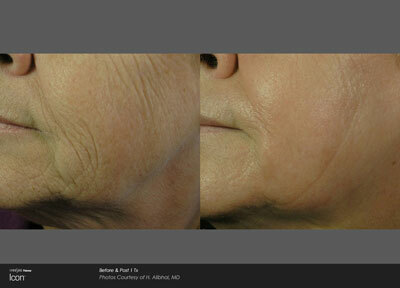 Many of our patients also achieve noticeable results after just one treatment with SmartSkin™ laser skin resurfacing. The SmartSkin™ procedure utilizes fractional laser technology to deliver microbeams of energy to targeted areas of the skin. This technique allows Dr. Bayati to treat deeper dermal layers, getting rid of damaged skin cells and helping the body’s natural healing processes to form new collagen. With the stimulation of collagen, the skin can ultimately look smoother and healthier for a very long time. In many cases, the entire SmartSkin™ laser treatment takes only about 30 minutes to complete. Some temporary redness, swelling, and skin flaking in the treated areas can be expected for a few days after the procedure. This treatment is customizable to each patient’s needs; a series of lighter treatments can result in less downtime as opposed to a single, more aggressive treatment. Results should continue to improve in the weeks and months following treatment as the skin’s collagen regenerates and creates a more youthful, healthier appearance. 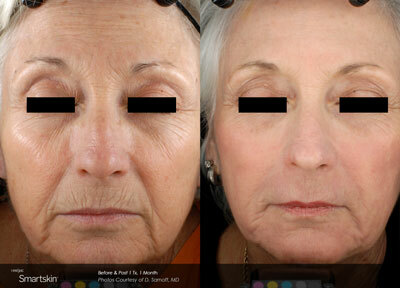 The effects of SmartSkin™ laser skin resurfacing can last for years with the proper care. To learn more about SmartSkin™ laser skin resurfacing, or to schedule a consultation with Dr. Bayati, please contact us today.